Section 1: Introduction Attitudes and Attitude Change: The Fourth Peak. 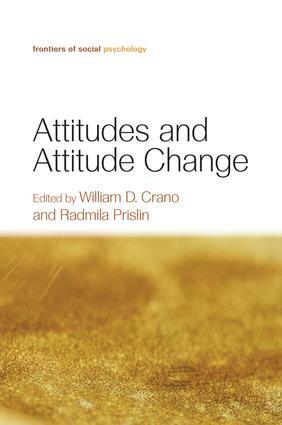 Section 2: Attitudes, Nature, and Measurement Structure of Attitudes: Judgments, Memory, and Implications for Change. Attitude Measurement. Implicit Attitudes 101: Theoretical and Empirical Insights. Section 3: Attitudes: Origins and Formation Attitude Formation and Change Through Association: An Evaluative Conditioning Account. Origins of Attitudes. The Role of Affect in Attitudes and Attitude Change. Section 4: Attitudes: Change and Resistance. Information Processing Approaches to Persuasion: Integrating Assumptions from the Dual and Single-Processing Perspectives. Attitude Functions in Persuasion: Matching, Involvement, Self-Affirmation, and Hierarchy. Section 5: Attitudes: Beyond Evaluation. A New Framework for Resistance to Persuasion: The Resistance Appraisals Hypothesis. Attitude Strength. Attitudinal Ambivalence. Section 6: Attitudes: Mutual Impacts of Beliefs and Behaviors Attitudes and the Prediction of Behavior. How Behavior Shapes Attitudes: Cognitive Dissonance Processes. Section 7: Attitudes: The Social Context Social Identity and Attitudes. Persuasion from Minority and Majority Groups. Normative Beliefs as Agents of Influence: Basic Processes and Real-World Applications. Frontiers of Social Psychology is one of the field's most influential and distinguished book series. Each volume provides a rigorous and cutting-edge overview of the most recent theoretical, methodological, and practical developments in a substantive area of social psychology, in greater depth than is possible in general social psychology handbooks. Coverage includes major established topics and new and emerging areas. The Editors and contributors are all internationally renowned scholars, whose work is at the cutting-edge of research. Scholarly, yet accessible, the volumes in the Frontiers series are an essential resource for senior undergraduates, postgraduates, researchers, and practitioners, and are suitable as textbooks in advanced courses in specific sub-areas of social psychology.